Money Metals Exchange began accepting Bitcoin payments for gold and silver bullion nearly 4 years ago, putting us among the very first in our industry to do so. Today, we are announcing expanded services – both when buying and selling precious metals – using numerous crypto-currencies. We believe honest money is core to liberating people and protecting their savings. History is clear as to how the game of unrestrained government borrowing, printing, and spending will end. The holders of the world’s fiat currencies will wind up holding the bag. There can be no doubt that tangible, off-the-grid, gold and silver – which feature zero counterparty risk – will have a key role to play in the future, just as they have in the past. It may well be that crypto-currencies will also have a role to play. Transact with Money Metals Using Bitcoin, Bitcoin Cash, Ethereum, Litecoin, and Dash! Our clients have long been able to make payment for precious metals using Bitcoin at MoneyMetals.com, as noted above. But that is just the start. 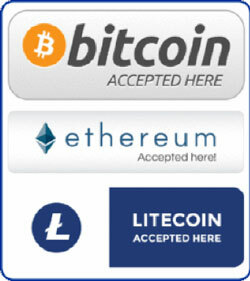 We are now proud to accept and send payments for metals in Bitcoin Cash, Ethereum, Litecoin, and Dash as well. People who wish to make purchases larger than our online maximum (meaning in excess of $100,000) can also call for help with that. We can generally offer lower premiums on the metals and the process is easy. Aside from our ability to accept payment in other crypto-currencies besides Bitcoin, what further sets Money Metals Exchange apart from other merchants in our space is our ability to make payments TO clients using a variety of crypto-currencies. We can purchase your metals and send you the digital coin of your choice as payment. This transaction can be done directly on our MoneyMetals.com website or over the phone. If you choose to sell to us offline, then call 1-800-800-1865 or email [email protected] and let us know you will be sending bullion you wish to exchange. When we receive the metal, we will contact you to lock the exchange rate and get the wallet address for sending the payment. Fees for this service are generally 3% or less, and we can deliver a wide range of tokens and coins. Money Metals is also a great platform for crypto-currency speculators who want to use precious metals as a safe haven. Our customers can swap Bitcoin (and other coins) for gold and silver to be stored by Money Metals Depository. Storing with us makes it quicker to swap back into crypto-currency when the time comes, and avoid the cost and hassle associated with shipping metals. We have seen interest in this program grow significantly in recent weeks. Some crypto-currency holders seek to take profits after the extraordinary move higher and reallocate funds to precious metals. Others plan to head to the sidelines for a period of time while questions and concerns over Bitcoin scaling and the health of some major exchanges, such as Bitfinex, get resolved. For many, parking capital in U.S. dollars is not an attractive option. We make it easy to park in physical gold and silver instead. Clients can do that with confidence. Money Metals Depository provides fully segregated (and independently audited) storage in a state-of-the-art Class III vaulting facility located in Idaho. The cost of storage starts at just $96 per year. A few metals investors are excited by what is happening in the crypto sphere and are looking to join in. Others want nothing to do with digital currencies or are looking to get out. Regardless of what you are planning to do on the crypto-currency or hard currency front, Money Metals can help you do it!